This user guide will provide a comprehensive overview of our vast audience catalog and teach you how to utilize the thousands of unique segments across all industry verticals. Whether you are interested in learning how to navigate our intuitive platform, build your own custom audiences, or gain a deeper understanding of applying and capitalizing on our solutions, we are here to help. Neustar AdAdvisor is available within over 60 platform partnerships that enable us to activate our distinct segments across the digital marketplace, or internally, within our own Identity Data Management Platform. 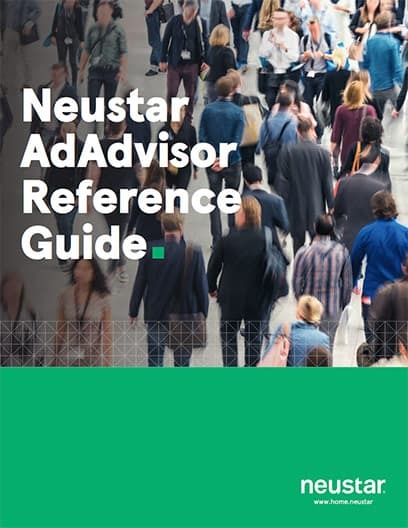 Thank you for downloading AdAdvisor Reference Guide! If you have any additional questions, are looking for audience recommendations, or you are interested in learning more about the Neustar difference, please email our data advisors at AdPartnerships@team.neustar.